This Pinnacle Peak Area Real Estate Map covers the Pinnacle Peak area East of Pima Road, North of DC Ranch and South of the Reata/Troon Area. To the East is the McDowell Mountains and the McDowell Sonoran Preserve. Shopping, dining, the General Store, and Russ Lyon Sotheby's International Realty can be found at Pinnacle Peak and Pima Roads. Watch this short video of the Canyon Heights Community, Scottsdale Arizona to better understand this area. Desert Foothills remains a rustic, rual desert area with low density single family residences intermixed with equestrian facilities. 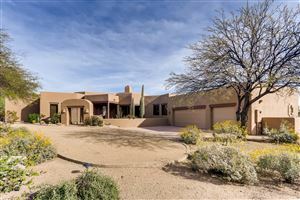 There is a rich assortment of architecture styles that include Pueblo, Santa Fe, and Western Ranch. Typical parcels range from one to five acres. The dominance of the lush upper Sonoran Desert will be maintained by blending new construction into the natural desert setting. Grayhawk, in North Scottsdale, is a master planned community on 1,600 acres, and features two distinct yet interconnected neighborhoods called The Park and The Retreat. They both offer a variety of prices, amenities and lifestyles. The community consists of more than 4,000 residential units with a broad mix of housing types. There are many community features that give residents a wide range of activities. Parks include playgrounds, basketball courts, picnic areas and grassy play areas. There's also the Grayhawk Walk trail system, beautifully landscaped for jogging, biking, or just taking a stroll. The Reata Pass / Troon Character Area includes the beautiful communities of Troon Village, Desert Highlands, Estancia, Troon North and Troon Ridge. This area is high Sonoran Desert, roughly 1500 feet higher than the valley floor with scattered granite mountains, hills, ridges, and knobs. Rainfall is almost twice that of the valley floor creating a thick, lush, and diverse landscape. Because of the elevation changes and the surrounding mountains, there are view opportunities all around. This is one of the most desirable areas in the Valley. The Pinnacle Peak area has some of the best “valley” views and is highly influenced by the presence of the McDowell Mountains and other mountains such as Pinnacle Peak and Troon Mountain. The area is dominated by low density, custom single family homes located in small to medium sized subdivisions. Roughly two-thirds of these subdivisions have public streets and no perimeter walls, while the remaining one-third are gated and have perimeter walls. 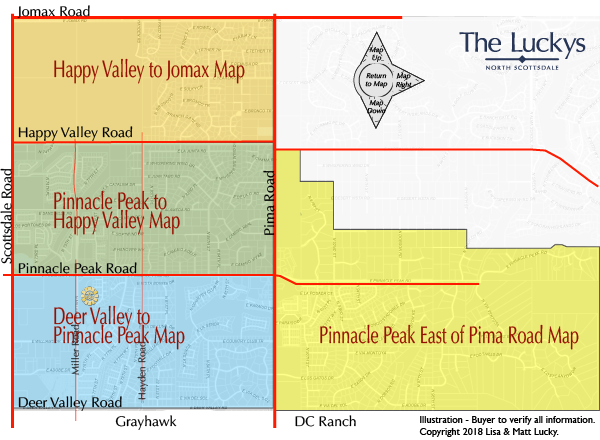 The most dominant landmark within the area is the cluster of businesses at the intersection of Pinnacle Peak and Pima Roads; and Pinnacle Peak and Scottsdale Roads. Around half of the non-residential uses and most of the single family homes have a “Mediterranean/Mission” design character, while most other single family homes tend to be “Santa Fe/Pueblo” in style. Those neighborhoods that existed before the area was annexed into the city tend to have Eucalyptus, Pine and Olive trees, while later neighborhoods typically have native and desert landscaping. See all Pinnacle Peak Area New. See all Pinnacle Peak Area Sold.